Student of the Year 2019! Last week I announced the winners of our Flash Fiction Competition. This week I have pleasure in announcing the winner of our Student of the Year Competition – Criselle Nunag from the Philippines – and the four runners up. You can read their stories here. As you’ll see, it’s not all about how much they’ve earned from their writing, but also about the other benefits (health and emotional well-being) that writing can bring. I hope that over the coming weeks, I’ll be posting guest blogs from some, or all, of them and next week I’ll be starting with Kunda Londa from Zambia. A couple of weeks ago I provided two quotes, one from Michael Morpurgo and one from Will Self. The former felt that you needed a full and varied life to be a writer, the latter considered writing to be akin to solitary confinement. The Arvon Foundation now seems to have both covered! They run three centres: The Hurst in Shropshire, Totleigh Barton in Devon and Lumb Bank in West Yorkshire. But in addition to the face-to-face short courses that they run in their centres they also offer online courses and tutorials and have a dedicated writers’ retreat (The Clockhouse) in the grounds of the Hurst. So whether you want to interact with people or you require solitude there’s something on offer for every writer. The Lumb Bank centre is the former home of poet Ted Hughes. 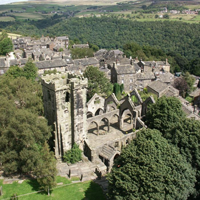 It’s located about half a mile from Heptonstall, a wonderful moorland village that lets you take a step back in time, and is the base for some splendid walking. It’s particularly interesting as there are two churches in its churchyard. The church of St Thomas a’Becket dating back to the 13th century is an atmospheric ruin after the west face of the tower fell down in a great storm in 1847. The present church is called St Thomas the Apostle. The ruins of the old church are very atmospheric – especially on the edge of dark when the local rooks are making their way home. Depending on your mood, it can also seem dispiriting and I suspect this is why Ted Hughes wife, Sylvia Plath, chose to be buried there after committing suicide. It’s said that her poem November Graveyard is based on the location. The entry fee is £10 and the closing date is midnight on 7th February. I’m sorry to be so late in mentioning this; I’ve only just picked up on it, but I do feel that it’s a particularly interesting opportunity if you’re serious about taking your writing to the next stage. Do go to the website and you’ll see exactly what they are looking for – everything is very clearly explained. As I mentioned earlier, my guest next week is Student of the Year runner up, Kunda Londa, who’ll be giving you his views on why a writing course can do so much to improve your prospects wherever you live. Comments Off on Student of the Year 2019! This entry was posted on Friday, January 25th, 2019 at 9:07 am	and is filed under awards, courses. You can follow any responses to this entry through the RSS 2.0 feed. Both comments and pings are currently closed.